Eastlake Studio has designed the offices of a collection of business and philanthropic organizations in Chicago, Illinois. Suite 1600 is a full floor headquarters office for a related group of privately held business and philanthropic organizations. 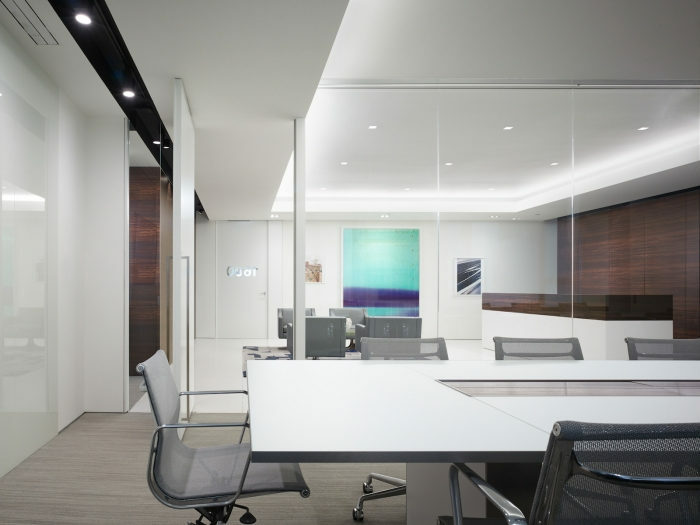 Ownership’s request for a quiet presence and subtly elegant environment led Eastlake to an office design marrying richly figured and fumed Eucalyptus millwork with extensive glazing. Incorporation of glass with varying tints and opacities allows for full appreciation of the impressive lake and city views, while reducing distractions for the office occupants. Throughout the suite, careful detailing minimizes the visual intrusion of structure, hardware, and engineered systems, allowing for the un-compromised beauty of pure space.